We report here on the observation and offline detection of the meteotsunami off the New Jersey coast on June 13, 2013, using coastal radar systems and tide gauges. 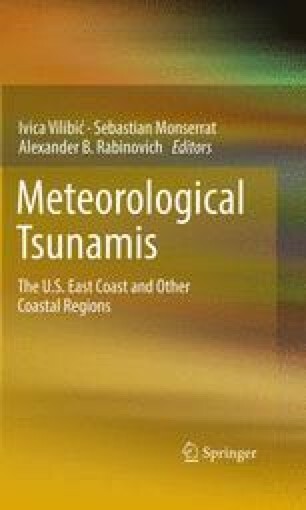 This work extends the previous observations of tsunamis originating in Japan and Indonesia. The radars observed the meteotsunami 23 km offshore, 47 min before it arrived at the coast. Subsequent observations showed it moving onshore. The neighboring tide gauge height reading provides confirmation of the radar observations near the shore. We thank the New Jersey Board of Public Utilities for the funding used to purchase the 13-MHz radars. This material is based on the work supported by the US Department of Homeland Security under Award No. 2008-ST-061-ML0001. The views and conclusions contained in this document are those of the authors and should not be interpreted as necessarily representing the official policies, either expressed or implied, of the US Department of Homeland Security. This work was partially funded by NOAA Award Number NA11NOS0120038 “Toward a Comprehensive Mid-Atlantic Regional Association Coastal Ocean Observing System (MARACOOS)”. Sponsor: National Ocean Service (NOS), National Oceanic and Atmospheric Administration (NOAA) NOAA-NOS-IOOS-2011-2002515/CFDA: 11.012, Integrated Ocean Observing System Topic Area 1: Continued Development of Regional Coastal Ocean Observing Systems.